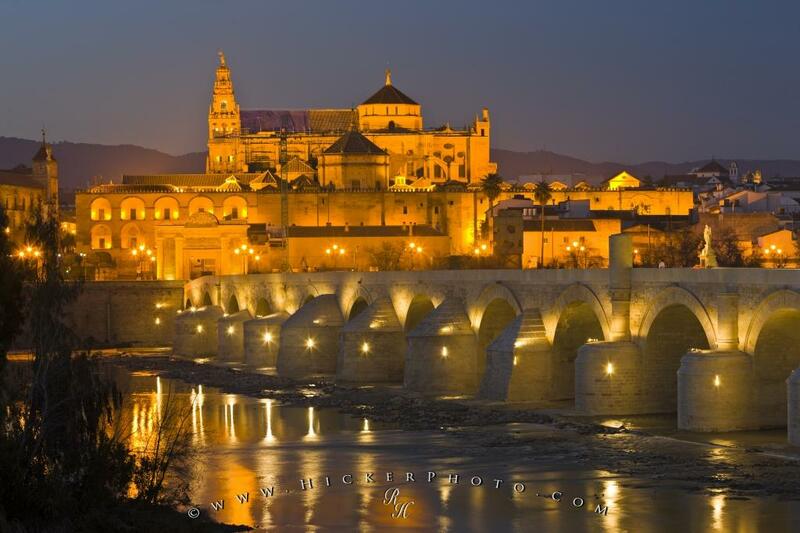 The Puente Romano spanning the Rio Guadalquivir in the province of Cordoba in Andalusia, Spain, is lit up at dusk with the Mezquita (Cathedral-Mosque) lit strikingly in the background. Cordoba is a popular tourist destination in Andalusia, Spain. The Puente Romano, which literally means Roman Bridge, spans the Rio Guadalquivir and is shown in the foreground of the Mezquita, the Cathedral-Mosque in the City of Cordoba, a UNESCO World Heritage Site in the Province of Cordoba in Andalusia, Spain. Both the Mezquita and Puente Romano are among the top tourist sights in the city making it a desirable travel destination and vacation-spots for visitors with a passion for ancient architecture and history. Photo of two sights in the popular travel destination of Cordoba City in Andalusia, Spain. Pictures from photo gallery "Cordoba City Pictures"
This picture is part of the photo album "Cordoba City Pictures" - there are more beautiful images waiting for you. ... However, none of the arches are still original due to the extensive restoration work that has had to be done to keep the bridge in good shape, but the original design is still there as is the idea behind it. Emperor Augustus built this bridge during the time he ruled the Roman Empire, which was from 27 BC to AD 14. Originally known as Octavian, Augustus was perhaps the most famous Emperor to ever rule Rome and gained a lot of inspiration from his Great-Uncle, Gaius Julius Caesar. He is very well known for contributing much to the Empire in terms of expansion and buildings and some of the things he built so many centuries ago, still stand, such as the Puente Romano. The bridge is protected and cared for as a UNESCO World Heritage Site, and that means that repairs are covered and upkeep is done in a consistent manner so that the bridge will be standing for many years to come. I photographed this photo with the digital SLR camera model Canon EOS-1Ds Mark III, aperture of f/10.0, exposure time of 1/0.125 sec. on ISO 50, as always I used a original Canon Lens, the focus lenght for this picture was 85mm.